You’ll draw! You’ll guffaw! You’ll be crying for more! Join Kow Kapow and the Bonsai Kid as they blast off on a wild, wacky and downright weird mission to find the Monkey Nut of Moo! Their quest will transport you to the far-off destinations of Superhero City, Deep Sea Disco, Creepy Castle and the Moovellous Milky Way. 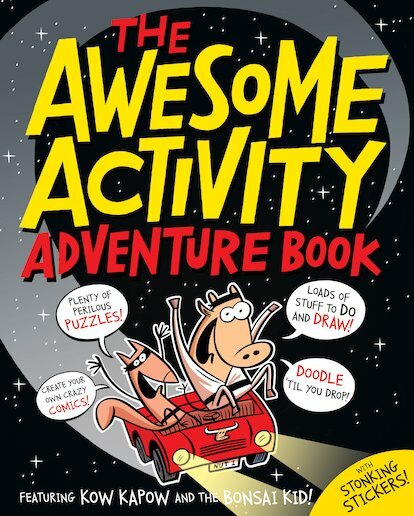 Along the way you’ll launch into dozens of doodle and puzzle challenges: spot-the-differences, crosswords, mazes, word searches, doodles, and crazy comics to draw! With tons of stonking stickers and over 300 pages of galloping drama, it’s time for a great big activity adventure! Yee-hah!